✓ Air frying creates a fried food taste with less oil. ✓ Onboard timer automates your cooking process - just set and forget. ✓ Removable fry pan lets you easily move fried food out of the cooker and onto your plate. ✓ Versatile functionality lets you fry, bake, grill and roast food. ✓ Simple and straightforward interface for hassle free usage. ✘ Have to be sure to layer food evenly in the fryer, without overlapping. Otherwise, the air circulation may cook some pieces of food more than others. ✘ While the fryer basket and pan are said to be dishwasher safe, some disagree. A handful of users say the basket’s teflon lining flakes after dishwasher use. 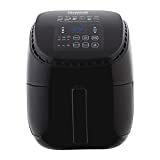 The Farberware Air Fryer is a reliable air circulation fryer that gets the job done. We like that you can use it to cook in more than just one way. It’s easy to clean and won’t leave a big mess for you to clean up. We love the oversized fry basket and pan. It makes cooking with the fryer a clean and easy experience. If you want to cook healthier food in a convenient way, consider buying the Farberware Air Fryer. 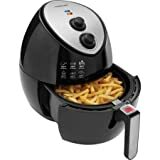 Air Fryers are all the rage in modern cooking. They let you make a tasty dish without using (much) fatty cooking oil. They’re safe to use – unlike traditional deep fryers that require boiling hot oil. Clean up is quick, and cooking won’t wreck your whole kitchen. 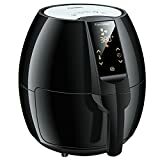 The Farberware Air Fryer has all the necessary features for someone that wants to try air frying for the first time. 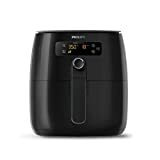 It provides all things you need to consider when buying an air fryer. Air fryers like the Farberware aim to provide “deep fried taste” without the nasty side effects of cooking oils. The Farberware uses rapid air circulation to cook your food. The device does this by moving air over its heating element at a high speed. The air moves over the food and cooks it to your desired setting. This fryer’s heating element is mounted above the basket to ensure a full and even air cook. Learn more about reasons why an air fryer is good for health. The Farberware Air Fryer uses only 1 tablespoon of oil (or less) to cook food. You won’t be working with a lot of grease, so there’s less chance of accidental spills. When you need to take food out of the unit, the fryer basket and pan helps you avoid dribbling oil and food debris. The pan and basket separate completely from the unit, so you can easily hand wash them or throw it in your dishwasher. You can put a baking pan inside of the Farberware and use it like an oven. The Farberware can be used to heat up previously cooked foods. Put frozen foods right into the fryer for an instant cook. Roast potatoes, cook a medium rare steak or fry up some tempura vegetables. The Farberware is multifunctional and can cook just about any dish. This might be the feature that makes this fryer a star. With the help of its oversized basket, the fryer can safely cook up to two pounds of food. You can get a good grip on the fryer’s large handle. It feels a lot like a big drip coffee pot. A two-step, quick release locking system keeps the fry basket and the pan from accidentally coming apart. When you want to separate them, it only takes a gentle press of the thumb. Both the fry basket and the pan are dishwasher safe. Aside from the on/off switch, you only use two knobs to operate this fryer. Use the first knob to establish the cooking temperature. It can be set anywhere from 175 °F to 450 °F. Turn the timer knob and determine how long your food will cook for. The timer can be set for up to 30 minutes. There’s a handy safe food temperature and fry time legend printed on the side of the unit. Use this to make sure you how long it takes to fully cook your food. Set a timer on the fryer and it will let you know when your food is complete. The Farberware will even shut itself off when it’s left idle. Compare this item with other air fryers in our best reviews.